As a leading tool repair specialist, Colonial Tool Group has experience with all brands of industrial spindles. We know that you invest a lot of money in tools and count on them to keep your shop floors, production lines and machines running. When your spindles are starting to show wear or are causing unplanned downtime, it's time for maintenance or repair. Our experts have the training and experience necessary to repair all types of spindles, including the popular Doosan brand. Many smaller outfits don't have the product knowledge necessary to properly diagnose and rebuild Doosan spindles. 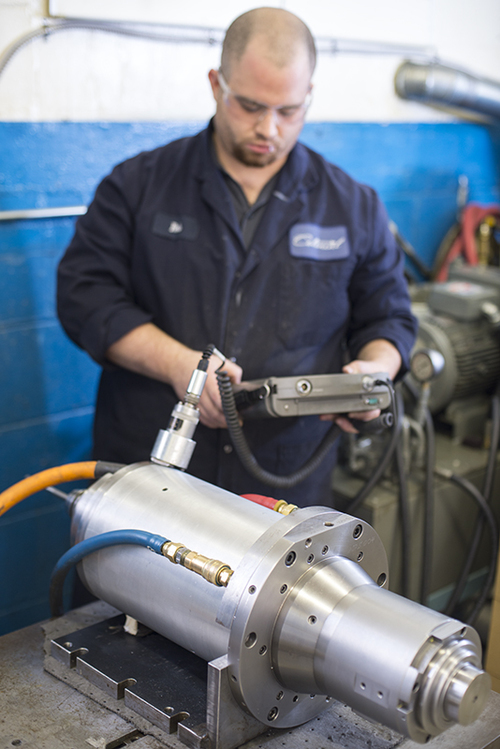 At Colonial Tool Group, we apply a methodical approach to spindle inspection and repair to ensure you're getting a like-new spindle back that will give you many hours of reliable service and better value for your money in the long run. Every tooling manufacturer has their own particularities. Doosan builds a range of high-performance precision spindles that are proven to be reliable and wear-resistant. Over time, even the best spindles can wear out and, in some cases, you might have suffered catastrophic failure due to an installation or machining error. Whatever the reason for your wear, our spindle repair specialists can diagnose and rebuild your spindles. We don't ship your Doosan spindles back to you until we're sure they're ready to be put to work. You have enough to worry about when it comes to keeping your production on track, and you need quality rebuilt spindles you can count on. Our team prides ourselves on our customer service, attention to detail and unbeatable repair and rebuild services. Let us know what problems you're having with your Doosan spindles and we will find the right solution. When your spindles and machine tools are out of service, you need to be reassured that someone is working hard to get them back to you in prime operating condition. With nearly 100 years in the business, Colonial Tool Group understands the needs and expectations of your business. You don't have time for shortcuts and can't be worried that a shoddy spindle repair or rebuild will keep you from getting the job done. Contact us today and we'll work fast to get your Doosan spindles back in like-new condition. Get the most out of your tooling investment dollars by trusting their maintenance and repair to our dedicated team here at Colonial Tool Group.